On March 12, 2015, Sir Terry Pratchett passed away. He was the author of more than seventy books, many of which I own and treasure. He is best known for his Discworld books about a fantastic world floating through space on the backs of four elephants, who in turn are resting on the back of a giant tortoise. With the exception of the most recent couple of books, I have read them all several times. I can’t just pick one at random and read it, I have to read the entire series in order. Since there are around forty books in the series, it is impossible to calculate how many hours of joy they have brought me throughout the years. The final book in the series will be The Shepherd’s Crown. I plan to buy it as soon as I can, but I will probably set it aside and read the entire series again before I read it. Pratchett’s daughter Rhianna has declared that she will not write any more Discworld books and she will not give anyone else permission to do so either. I can’t help but feel that I will be saying goodbye to an old friend when I read The Shepherd’s Crown, but I prefer that to having the series continue under a different author. After I heard that Pratchett had died I found myself staring at the Discworld books on my shelf, trying to pick out my favorites. The Color of Magic immediately leapt to mind. It’s the first book in the series where we are introduced to the Discworld’s first tourist, Twoflower, and his indestructible, vicious Luggage. Then there’s Mort, where a young boy becomes the apprentice of Death, or Wyrd Sisters, where we get to meet Granny Weatherwax, Nanny Ogg and Margat Garlick, three witches who live in the mountains in Lancre. Or it could be Guards! Guards!, where the members of the Night Watch of Ankh-Morpork are introduced. There’s Commander Vimes, Sergeant Colon, Corporal Nobbs, and their newest member, Carrot, a human raised by dwarves. There’s Reaper Man, where Death quits his job and looks for greener pastures, or Lords and Ladies, where elves come to Lancre to conquer the tiny kingdom, but they didn’t count on Granny Weatherwax. There’s Hogfather, a tale of the Discworld’s Santa Claus figure, or The Last Hero, an illustrated story of Cohen the Barbarian. 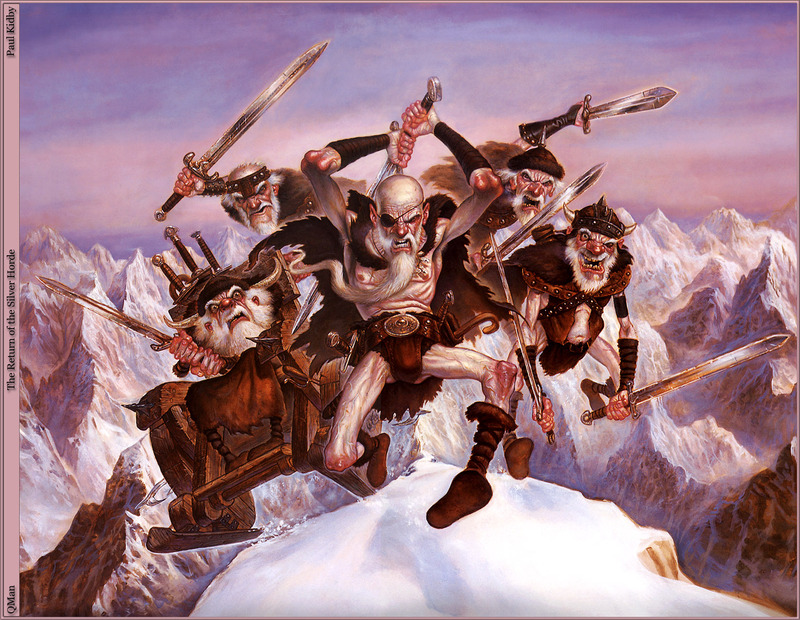 He has grown old and his adventuring days are coming to an end, so he and his Silver Horde (Boy Willie, Caleb the Ripper, Truckle the Uncivil, and Mad Hamish), set out to return fire to the home of the gods which, unfortunately, will also destroy the Discworld. I saw all of these and I wasn’t even close to going over all the books in the series. It was clear I was going to be unable to pick even a top five list of Discworld books. Since I couldn’t pick my favorite books, I thought I might make a list of my favorite characters. There’s Rincewind, an incompetent wizard whose main talent is running away from danger, Granny Weatherwax, a no nonsense witch, or Nanny Ogg, her earthy best friend and co-witch. Samuel Vimes, the commander of the Night Watch of Ankh-Morpork. He’s a man who knows his city like the back of his hand and refuses to give up until he sees justice done. Then there’s Carrot, the new member of the Night Watch who is incredibly enthusiastic, has the uncanny ability to bring out the best in people, and who just might be the rightful king of Ankh-Morpork. There’s also Tiffany Aching, a young girl who has to learn how to be a witch when there is no one to teach her, or Moist von Lipwig, a swindler who gets forced into government service and finds that he is very good at his new job. Cohen and the Silver Horde would also definitely have to make the list, as would the Librarian of Unseen University. He was turned into an orangutan by a magical mishap and strenuously resists any effort to turn him back. I soon realized that I had the same problem picking my favorite characters and I did picking my favorite books. They are all so good that I just can’t pick favorites. I am sad that there will be no more Discworld books after The Shepherd’s Crown, but I am grateful for all of the happy hours I got to spend in Pratchett’s incredible world. If you are not familiar with the Discworld, do yourself a favor and start reading about it. You will be glad that you did.